For the last two years, my extended family has come together to charter a boat from Miss Grace Charters in Deale, Maryland to go fishing. The first year was our initiation to this kind of fishing and it took some convincing to get everyone there. The fears of being on a small boat tossed about in the middle of the Bay under the scorching July sun were hard to overcome. However, one part of that was easy to alleviate since the boat, Miss Grace is anything but unstable. With its wide 15 foot beam, she powers through the waves with a 600 horsepower diesel engine and we could walk about with ease. Last year, we were totally impressed with the comfort of the boat, the temperature of the air on the bay, the amount of fish we caught, the talent of Captain Karl to find the fish, and the incredible work of the first mate Eric, to unhook the fish and rebait the lines in record time - as well as filleting the fish for us afterwards with his outstanding knife skills. So this year, we had to plan the trip again. A few more relatives joined the ranks and one fell off our list, unfortunately. 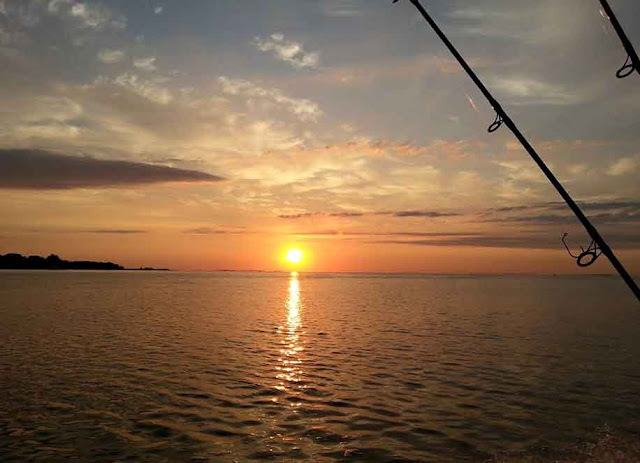 The hardest part was getting up early enough to drive the hour and a half to get to the boat by 5:45 am. Some folks chose to drive down the night before and stay in a local hotel, but the majority of us carpooled in the early darkness - the experience only added to the sense of adventure. We heard from some of the chatter around the docks that fishing was bad - a month of record-setting rain in June had fouled the catching - but we didn't worry. We climbed aboard with our coolers stuffed with hoagies, snacks and cold beer and and set off before the sun had risen. The freshness and the beauty of the Chesapeake is revitalizing that early in the morning and we powered out for almost an hour to get to the fishing grounds. The first mate set a couple of trolling lines and we slowed down a bit to test the waters. Sure enough, after a few minutes, "fish on" was being hollered out and a bluefish was flying through the air over our heads to land in the large cooler in the center of the boat. I had never experienced trolling for fish like that. As soon as the lines started jerking, the closest person would grab the rod and start reeling in the line and then the first mate would grab the line from the back of the boat (because we were still moving along) and with a big pull bring it in over our heads to have it land in the cooler and simultaneously yank the hook back out. For almost four hours we trolled and caught fish until the sun was hot and we were trying to stay under the shade of the roof of the cabin. Captain Karl took us out to a couple more fishing spots and we did catch a couple more, but overall, we were ready to head back. Since it took almost an hour to get back to the dock, we had plenty of time to talk and eat and just enjoy each other's company. In conclusion, if you were to ask me for my opinion about charter fishing, well then, I would say a resounding "Hell-yes!" How could you not like it? 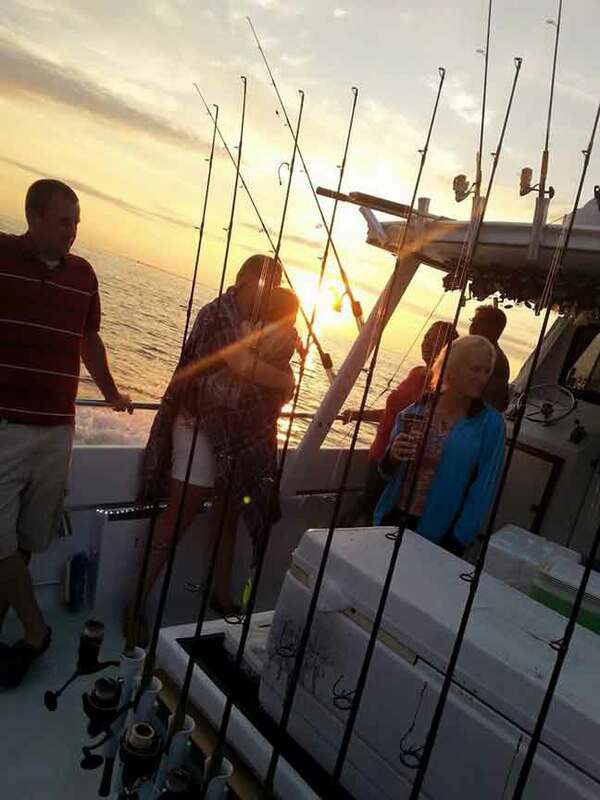 We caught sixty-three fish and took home coolers of delicious, fresh bluefish. 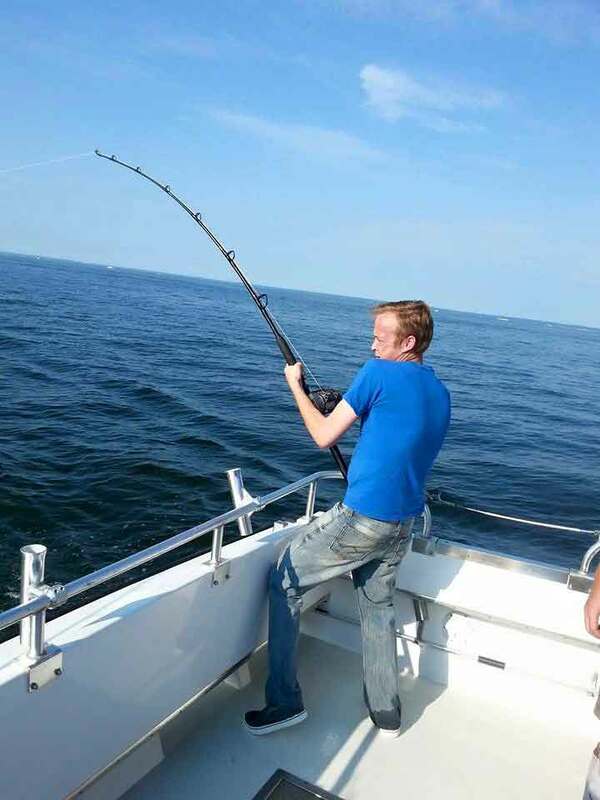 Trolling was different than the normal fishing I was used to, but I enjoyed everything about it. Then I dropped them into a boiling vinegar water of 3 cups water to 1 cup white vinegar, turned the heat to low, covered and cooked for about 7-8 minutes. Then lifted the fillets from the water and let cool. Combine all ingredients except fish, then add the fish gently so you don't mash it. Form the cakes and roll in crushed potato chips (optional) and let sit for at least 10 minutes. Fry in butter/oil until golden brown on both sides. Serve with a garlic aioli sauce (I added roasted red peppers and lemon juice to the sauce) on a soft bun. 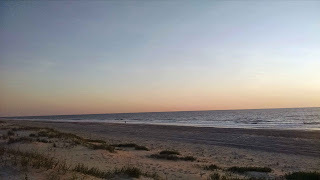 This July, I enjoyed a few days away from the summer heat of the Chesapeake Bay by heading south, ironically. 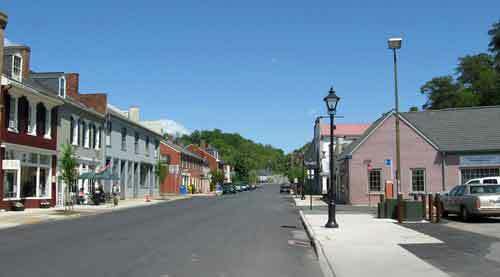 We headed west to an area just east of the Shenandoah Valley to a little town called Scottsville. A few months earlier, I made reservations with a Bed and Breakfast called the High Meadows Vineyard Inn. The reviews looked good and I was hoping to combine a pleasure trip along with a work day for my husband as he often had to drive down there for business. My plan worked and that Friday, after he finished his appointments in Fredericksburg, we continued southwest to our destination. But let me back up for just a second. If you like antiquing, Fredericksburg has more antique stores than I have ever seen. I browsed through many but didn't find anything that I needed so they didn't get my money. I did stop in a little shop, Kickshaws Downtown Market for a drink and ended up buying a basket of little beautiful red plums. They have a nice assortment of fresh produce and grains, coffee, and I think they are worth your time to check out. 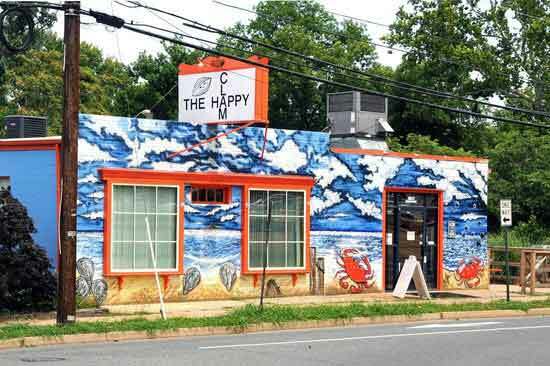 We did find a little place to get lunch close by that is worth mentioning, the Happy Clam. We drove by the place and there was a big open sign and with a name like that, we took the bait. The food was simple, but so delicious; huge portions of fried flounder, very lightly breaded with cornmeal and served as fresh as if it came out of the water. The price was low and the sides were fun, but it was the fish that shone. We saw that they served soft shelled crabs as well as a nice assortment of seafood. Plenty of customers were ordering food to go while we ate our lunch. Check in was around four, but we didn't make it until closer to five. Thankfully, we had GPS for directions as the Inn was in a little town, on a little road, on a little driveway. The Inn is eclectic at fist sight. 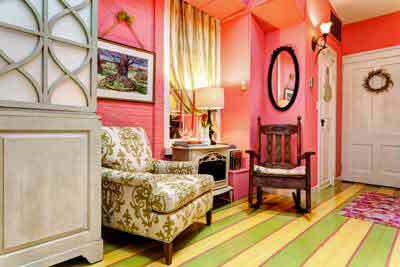 Bright colors adorn every surface of the exterior and bright pink doors accepted our entrance. The hostess, Nancy greeted us as we entered and proceeded to explain the home, the history and her passion for the place. Our room was large with high ceilings, a handsome king-sized bed that was almost too high for me to jump up on and a large jacuzzi tub. After wandering around the place and the well gardened grounds, we headed out to check out the James River and the downtown of Scottsville. A large levee held back potential flood waters and kept the tiny town safe but blocked off the view of the river. The river made a deep bend at the town and a tall bridge crosses at the site. 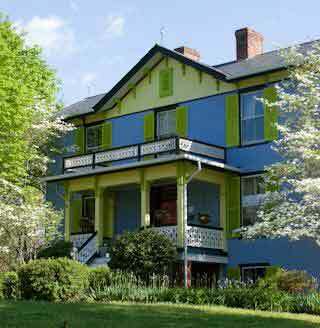 A train track runs between the town and the river and plenty of history is obvious in the older homes and buildings. Heavy rain made the water brown and filled the banks. 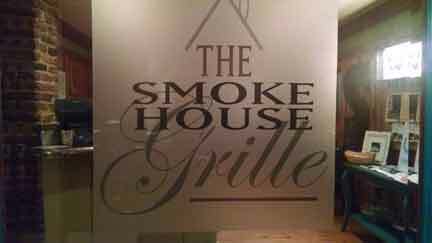 There were a few restaurants in town and we chose the Smokehouse Grille. There was a decent crowd inside and we had to wait a few minutes at the bar. We didn't even notice the wait when their bartender served us a perfectly poured mint mojito. The restaurant interior was a nicely decorated mix of wood walls and floors and artwork. Since it was summertime and still a decent temperature outside, we chose to sit on their outside patio overlooking the smoker. Writing a good review of our dinner was not hard as the brisket was so well flavored and incredibly tender. The ribs were full of smoky flavor and we had three of their house-made sauces to dip them in. A shout-out also goes to the baked beans - some of the best we have ever eaten. We assumed we ordered enough to take back with us for a midnight snack, but we finished every bite. Apparently they also had some amazing desserts but we were too full to try any. Our sweet tooth was satisfied with a delicious locally brewed stout beer. That night, we situated ourselves in our room and watched a movie on my laptop as none of the other guests of the Inn were around and it was too buggy to go outside. As morning greeted us with a rather gray face and with the sound of rain on the windows, we were dubious about rafting on the rain-swollen river. We decided on a change of plans that involved checking out the local wineries - but after breakfast. Bed and breakfasts are always a risk as you never know what kind of accommodations or food you might get - but we are not too worried about the risk as we enjoy the newness of each one. Our breakfast was served on the back porch and included tender crepes, plenty of fresh fruit and great coffee. We left for the day with our appetites satisfied. If you ever have the time, you should check out the vineyards of Virginia. The rolling hills patterned with the rows of vines make you think you are visiting Italy. 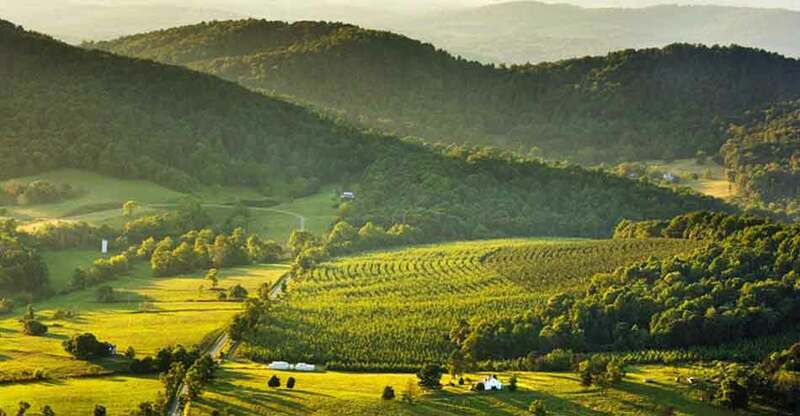 We checked out several wineries and got the impression that the wine industry is still evolving in Virginia, even though commercial.grapevines were planted as early as 1970. The humidity and rain are not friendly to grapevines. Lots of the wineries are experimenting with fruit flavored wines. By the end of the day, we were ready for a change and found a brewpub (The James River Brewery) to listen to some live music in their beer garden and enjoy some of their stout. Since they did not serve food, we ordered pizza from a restaurant across the street and relaxed until the sun set and the mosquitoes took over. We found the area perfect for a weekend visit and were ready to hit the road again (after another delicious breakfast of eggs benedict and multi-colored melon wedges.) On the way out of town, we found the most amazing apple orchard on the top of a mountain overlooking the whole area - The Carter Mountain Orchard. Fresh peach doughnuts perfumed the orchard store and if you are ever looking for an amazing place to enjoy lunch, they have plenty of picnic tables overlooking the panorama below. 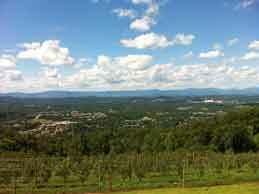 So that was our escape to the cool rolling hills of Virginia. Check it out for yourself if you have a weekend free. 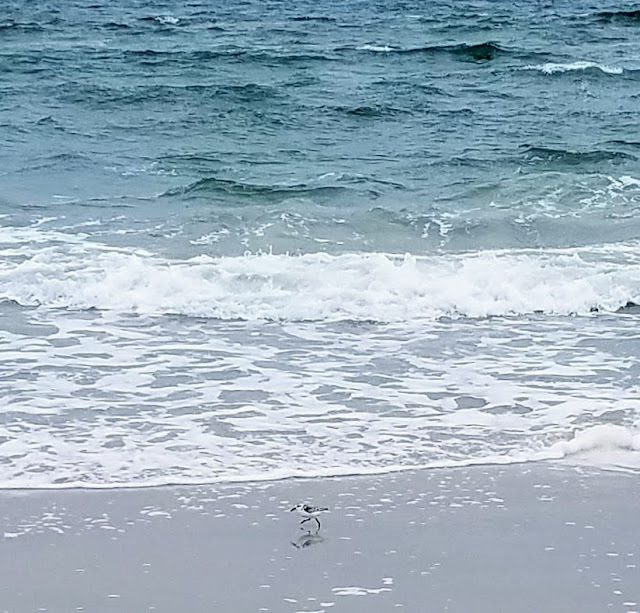 Have you ever gone to the beach for the day and after having been lulled into the comfort of the rhythm of the waves, the cool briney air in your face and the sun on your back and wished you could just sleep right there? 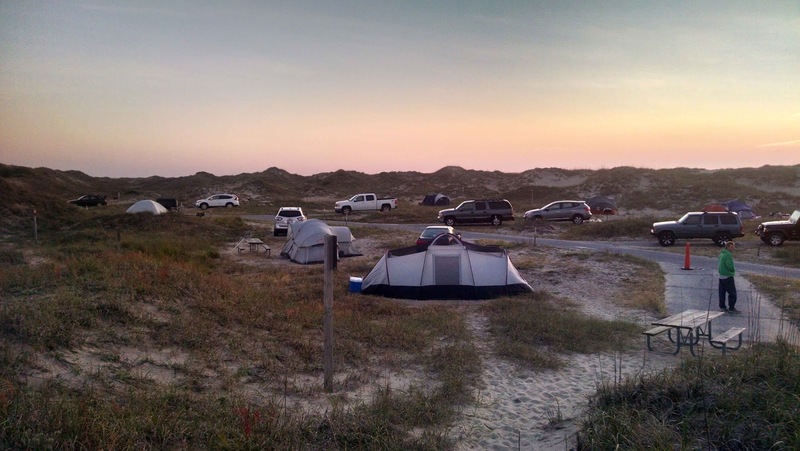 Evenings and night times on the beach were exactly what we were looking for when we researched camping on the dunes of the Outer Banks: the wild and crazy waves and the abandonment of the area, so battered by the ocean that nothing permanent seems possible. 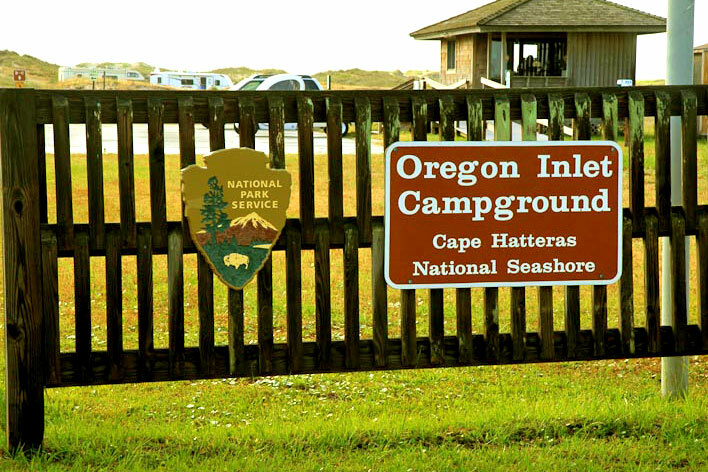 The Oregon Inlet Campground was the only site that had space left on Memorial Day Weekend and their spaces were on a first come, first served basis. The campground was easy to find and we tried to get there as early in the day as we could so we wouldn't be left with the last available campsite. We had about a five hour drive so we arrived in the early afternoon. The camp rangers were friendly and seemed quite jovial between themselves. They gave us maps and explained the setup and let us pick a site from the available openings. Since the camping was a bit closer than we were used to and there were no trees - only sand dunes for privacy, we chose one that sheltered us from the wind and most of our neighbors. It was windy! Normally, I absolutely love the windy ocean, but putting up our tent was a little challenging and we were not convinced the wind wouldn't blow it over so we used extra rope to tie it down to the picnic table and the grill, both of which were well anchored. Once settled in, we set out to explore the area. We could hear music and climbed over the dunes (on the pathways provided) and saw a long row of trucks. Apparently, this was an area where folks could drive in and park on the sand. A few kids were swimming but most of the people were enjoying the sunshine in spite of the cool air. We meandered along the sand, stepping into the water and checking out the amazing collection of sea shells littering the beach. The fresh air made us hungry and we went back to our site to cook up some specialty sausages that Eric had found earlier in the week. 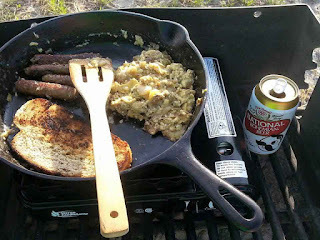 We brought a butane stove as open fires are not allowed and it worked well even in the wind. By the time the sun set, we were ready to crawl into our tent. We could hear the wind from the ocean and the waves, but no people. There were no bugs because of the strong winds, but there were sand thorns - a little sharp 1/4 inch sized bit of plant that blows along the area, clinging to anything, including your skin. We did read the literature about them and were prepared with shoes, but they were so aggravating when they got in the tent. Our remedy was duct tape used like a lint roller. The morning was fresh and quieter than the evening and we found waking up easy as the brightness of the sun permeated our tent. 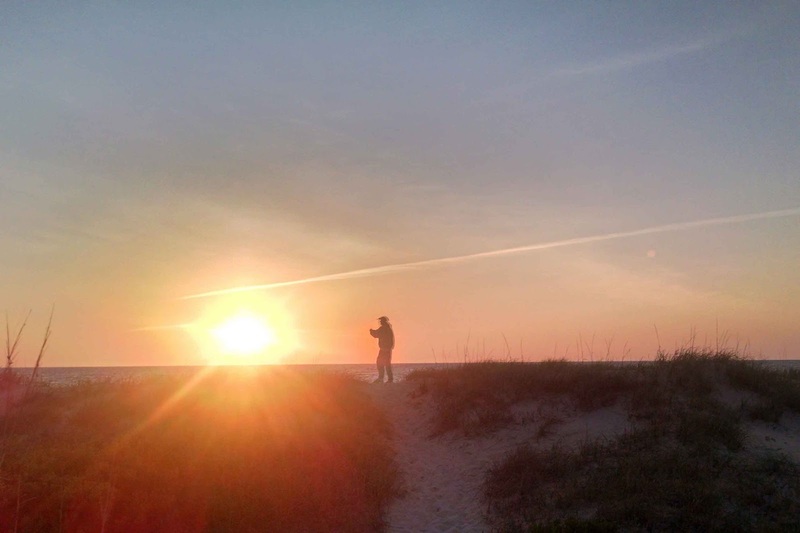 Of course, we had to try to see the sunrise over the water at least once. 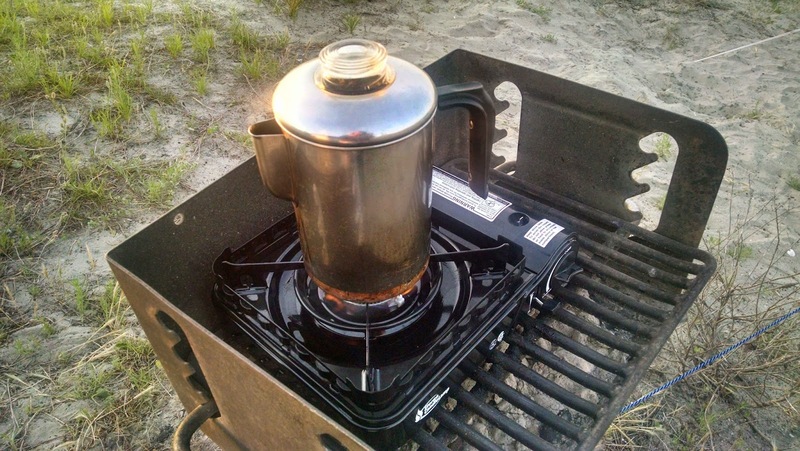 Coffee brewed outside is so delicious! On our second day, we explored by driving down the island and checking out other areas. The sand moves constantly and I always look to see how different the dunes look or where the road is almost covered after a strong wind. Most of the beaches were empty and it was hard to fathom going to a beach where crowds line up in the sand, smelling each others' coconut lotions. The rawness of nature was refreshing and inspiring. Of course, as we drove, we found communities where the noise and the commotion came back but we didn't mind. We really wanted to go crabbing and looked around for a perfect spot only to realize that most people didn't take the time to crab. 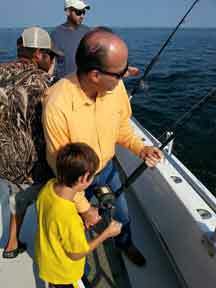 We did try a few different spots and used a regular fishing pole with a small bait fish tied to the end. 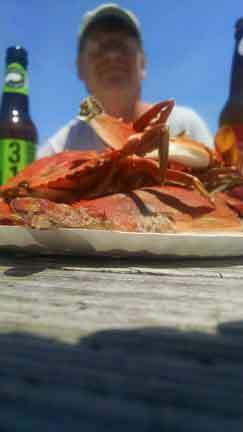 A few crabs met their demise and we had a beautiful lunch. 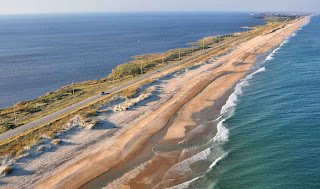 With our food supplies running low, we decided to drive into Nags Head and see if we could find a good restaurant along the water. We did a little online research with Yelp, and were happy to find a seat on the beach at the Pier House Restaurant. The people watching was great fun and the food was good, but the location was perfect. Lots of folks pass through the restaurant to go fishing and then they can bring back their catch to be cooked by the chefs. If we had known, we would have tried fishing, but maybe next time. The temperatures warmed up on the day of our departure for home and as the bugs came in and the humidity soared, we were glad to move on. The campground is rustic with only cold showers and toilets. We had no electricity or internet access and although it's unique for a night or two, we were missing the comforts of life as we know it. 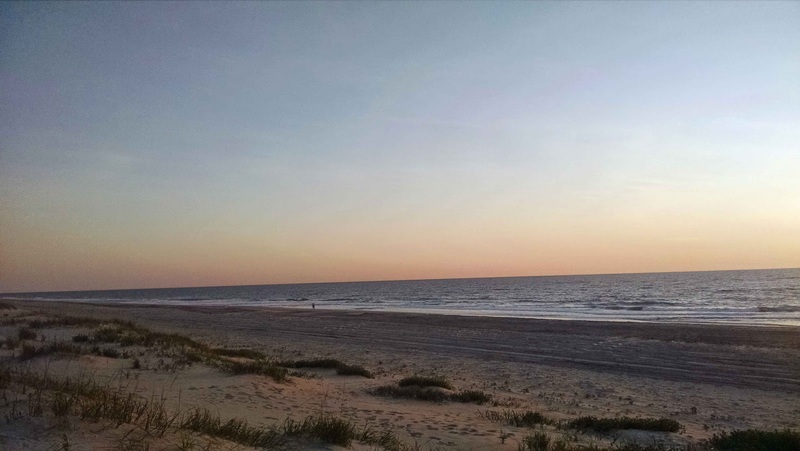 I love the Outer Banks and highly recommend visiting them to anyone who doesn't need the boardwalk or nightlife to be entertained. 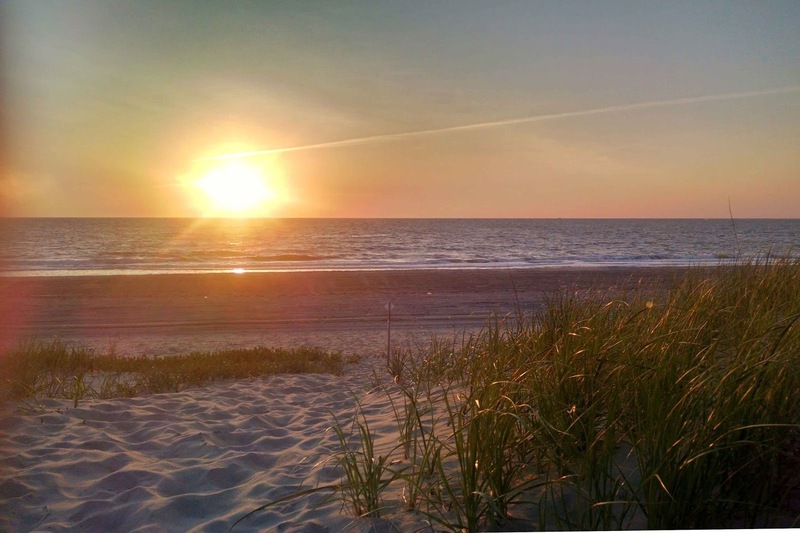 Even if you don't camp on the dunes, a day at the beach there is so refreshing of an experience, I think most people would find even a few hours very enjoyable.